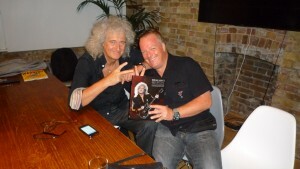 The launch party for Brian May’s Red Special took place on Wednesday 1st October at the Century Club in Central London. 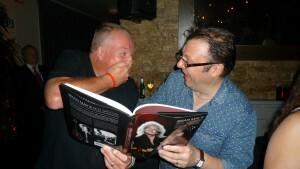 We’re planning to share a wealth of pictures from the event very soon, so keep checking back to www.theredspecial.com. We also hope to post some video taken of Brian, who spoke at length during the evening about the book and also demonstrated sounds from the Red Special itself, which was something very, well, special indeed. Simon Bradley and Andrew Guyton share a joke. Bless.